Whether it’s your first foray into the world of online and mobile casino-based games or you’re a seasoned professional, even the smallest outlay can seem like a gigantic amount when you’re low on confidence. If you simply want to enjoy a casino game without spending money it is possible to do so – this is when a practice app can be a good idea. This article will run you through the different games that are available, and provide you with the information on which apps are the best to improve your gameplay. There are a swag of casino game training apps available in the app stores, although there is another option. The casinos in this table all have some form of freeplay available, although you may have to sign up for an account to take advantage of this. What is a practice app? A practice app is exactly as it sounds; an application on your phone that will allow you to play your favourite casino-based games for free on your phone. Everything ranging from blackjack to poker all the way through to roulette is available on our smartphones and tablets via app stores like Google Play and the Apple App store. A practice app is a learning tool, a live-time guide and the best friend for experienced player to novice alike. It’s also a great way to get to know the rules of your favourite casino games without having to bet real money just yet. Finally, it’s fun and free. Royal Vegas Casino, one of our top recommended Internet gambling sites, offers a fully free version of their mobile casino suite. Regal Vegas is their official practice app available to download via your smartphone or tablet devices by tapping on the app images on this page while on your device. Regal Vegas offers up high-quality Microgaming-developed casino games, including European Blackjack Gold and Roulette, a ton of fun slots games like Tomb Raider and Thunderstruck II, and more. For an authentic casino game experience but without having to wager real money right away, it’s our recommended option for Australian players. Those looking to try their luck at the ever popular Roulette need look no further than Roulette Live manufactured by AbZorba Games. Roulette live offers gamers the ability to play every style and facet of the popular game of chance, with ‘strategy’ and win percentage guides that offer both a unique and educational feel for those who are new to the game. Blackjack is a go-to table game at the casino, but not everyone is familiar with how the famous card game works. For those looking to pick up the requisite skills, improve themselves or just have some fun, Blackjack21 should be your app of choice. The app offers both online and offline play, tournaments and plenty of other options. One of the most popular poker sites on the internet – PokerStars – also has a free play section within their app. This means players keen to hone their skills at the poker table without the added pressure of a financial outlay can do so with one of the world’s most popular internet poker providers. Pokerstars offers all the popular poker variants for their freeroll tournaments, including Texas Hold’em, Omaha stud and Seven card stud. In addition to these, Pokerstars’ freeroll tournaments often lead to real money and real money tournaments, so even if you are not prepared to lay down your hard earned cash, there is still an opportunity to get yourself into the real deal poker. Once you have had your practice and accumulated the skills required, the next step is to try your hand in the world of real money. If it is specifically Poker you want to play, Pokerstars is your go-to app. If you have followed this guide and used their freeroll feature, you will already be familiar with how Pokerstars works, you will just have to deposit funds into your account to access the real money area. Pokerstars has 24/7 support, secure deposits and award winning software, which makes it a top-tier choice for mobile poker players looking for a real money poker app. 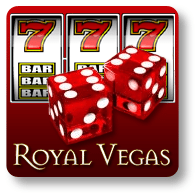 In terms of online casinos, Royal Vegas Casino’s official app is the go-to application for serious gamers. The app is labelled as ‘Regal Vegas’ in the app store listings as the free-play option, but upon downloading it, you can switch to real money mode from within the app itself. With an Instant Play option (play at Royal Vegas as usual through your mobile device’s Web browser), or the site’s dedicated downloadable app (download, install and play Royal Vegas’s games through an app on your phone), users have flexibility at their disposal. Coupled with a huge $1,200 AUD matched deposit bonus, it is little wonder Royal Vegas Casino is the casino-based app users return to when they want to indulge in some gaming action. Download the official Royal Vegas Mobile Casino practice app, Regal Vegas for free casino games to practice and play for fun, and switch to the real money interface whenever if you like – and enjoy a $1200 welcome bonus when you do.